That's not the dictionary definition of believe. It's what was told to me a long time ago. What it meant was that sometimes holding on to a belief a little too hard blinds one and leaves one open to deception. It still makes sense to me. Is it all that bad to just say "I don't know for sure." More than a few times in my life, even as a young kid, I've been accused of asking too many questions and wanting to know too much. Is that a legitimate criticism? I may go overboard here sometimes but in personal interactions I've tried to make the questions count and pick the right time and place without ticking off people unnecessarily. I've found that questions tend to work better than opinionated statements, but not always. Nowhere is that statement more evident today than with the Snowden/Greenwald saga. Question these 'heroes' and those invested in the narrative often become very defensive. 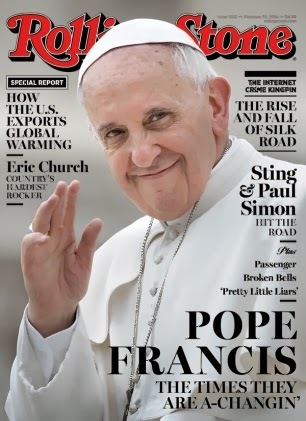 Since the pope made the cover of the Rolling Stone, is it still OK to question whether he is actually making an effort to change the Catholic Church or is there something more to the story? Francis's good guy persona is refreshing but maybe it's all about the bottom line. The church needs more members which means more money and saying the right things goes a long way. Now if he opens up ALL of the Vatican's archives to researchers, it would be a major step towards proving that it's time for the secrets to end. It won't happen because exposing the secrets could mean lessening the control and isn't control what it has always been about? Questioning religions, although necessary, is often a sticky situation and is a good way to alienate even those close to us. Discretion is often needed and that's easier said than done. How about the new 'religions?' The new age type. If you've kept an eye on this 'movement' or possibly been involved, John Lash has, to me, an interesting take that asks questions. I cannot possibly summarize even the basic outlines of this trajectory in a short essay. Suffice it to say that the NWO agenda, if it is to be defeated, has to be seen as it relates to the New Age agenda. One must ask, how are the two related? Both present visions for a global or planet-wide society, but obviously two extremely different conceptions of such a society. Or are we considering one vision in two different guises? It has been argued that the NAM, especially in the visionary scheme formulated by Theosophists Madame Blavatsky and Alice A. Bailey, is nothing but a disingenuous program to sucker people into the NWO nightmare of globalist mind control, disguised as a vast spiritual awakening, guidance by a spiritual elite, the unity of all religions, etc. Was the recent historical version of the NAM platform, following Blavatsky and others, originally conceived with that intention in mind? Does the Illuminati hell of globalist tyranny, implemented in the style that combines 1984 and Brave New World, incorporate for its purposes the pernicious lure of an Aquarian heaven on earth? One could debate endlessly on this touchy issue. To do so would open up enough rabbit holes to occupy a team of 1,000 researchers for decades. In my analysis, principles and proposals of New Age or Aquarian Age spirituality may be adopted to the NWO agenda, but they can also remain free of that association. It depends wholly on who is trafficking in these principles and proposals, and for what purposes. Whether the NWO control-freaks are using New Age idealism or not, the vast majority of New Agers are so lacking in discrimination, not to mention basic savvy for social observation, that they would not even know if their precious ideals were indeed being played in that manner. That ignorance is the real and present danger inherent to the New Age movement, making it the possible and plausible accessory to insidious agendas of social manipulation and mind control. Ultimately, the two socio-historical trends leading toward the NWO hell and New Age heaven might converge, which would be a huge victory for the globalist psychopaths. We get to question virtually everything but there are a few things that we have been indoctrinated to believe that is taboo. The jews and Israel come to mind. A taboo over 100 years in the making. It's worked fairly well but not so much anymore for a growing number of folks. The media tries to make other subjects taboo as well but that's not working either. Nothing can be off limits when questioning crimes and injustices. I believe that to be true. Maybe having a few beliefs every now and then does do us some good. Good questions and its kinda ironic to me that they are being asked by John Lash. He has the right ingredients but is looking at them in the wrong way, I think; like looking down the telescope from the wrong end. Of course, a world government (NWO) needs a world religion. It is ironic, too, that the world has been here before - and for the same reason. The Emperor Constantine needed a 'one world religion' to keep order (power) over his extensive empire; one that he could not hope to police solely with military personnel. He needed to control his subjects minds. So he created the Roman (Empire i.e. Constantine's) Catholic (Universal i.e. One World) Church (religion). He did it by combining Christianity (whose non-psychopathic nature was a threat and whose leaders he had previously put on the State payroll) with Judaism (by incorporating the Hebrew Bible complete with a vengeful god and a priestly power structure) and Mithraism (and a couple of other minor religions - also into power) from which came the festivals, dress-ups and rituals. It was very successful. You might say it worked like a charm! Most Christians don't know Constantine and how their religion got kick started. To even look very deep into that part of the story might just create a cognitive dissonance regarding the basis of their beliefs, that it was all divinely inspired. Regarding Pope Francis, I don't remember if it was Stafford Beer or Hazel Henderson but one of them said something to the effect that leaders cannot lead anywhere other than where the organisation is already going because leaders are a product of the system and never the other way round. Plus there is always Jesus' enduring advice, "By their fruits, you shall know them". I think what we are seeing from Francis is exactly what any PR organisation worth its salt would prescribe for the church leadership, anyway, especially after the Ratzinger debacle. PR is the short and sweet of it. Image and perception. A change that may be more illusion than substance but it's working somewhat for now. It seems to me that the concern about "New Age" religions is mostly Christian hysteria. A real and present danger are the millions of Judeo-Christian Zionists who are manipulated by jewish neo-cons to support Trotsky's permanent revolution for the advancement of the Jew World Order. In humanities, comparative mythology and religion...is the study of the complex mythical heritage and syncretism underlying the formation, derivation, and origin of the world’s modern religions. "All formal dogmatic religions are fallacious and must never be accepted by self-respecting persons as final. Fables should be taught as fables, myths as myths, and miracles as poetic fantasies. To teach superstitions as truths is a most terrible thing. The child mind accepts and believes them, and only through great pain and perhaps tragedy can he be in after years relieved of them." "There are two things which I have come to look upon as constituting the unpardonable sin of the father and mother against the helpless innocence of infancy. The one is in allowing their little children to run the risk of blood-poisoning--such as was once suffered by a child of mine--from the filthy fraud of vaccination. The other is in permitting the mind and soul of their children to be inoculated with the still more fatal virus of the old, false, orthodox dogmas and delusions, by allowing them to believe that the fables of ancient mythology are the sacred and solely true "Word of God," if they are found in the Hebrew Scriptures--the one book of the religiously ignorant. Generation after generation we learn, unlearn, and relearn the same lying, legendary lore, and it takes the latter half of all one's lifetime to throw off the mass of corrupting error instilled into us during the earlier half, even when we do break out and slough it off in a mental eruption, and have to find ourselves in utter rebellion against things as they are. 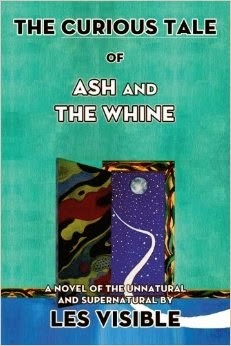 Unfortunately, the mass of people never do get rid of this infection, nor of the desire to give their disease to others." All these whistleblowers are either gay or effeminate looking, which seems to be part of the message. Justin Raimondo is another example. He sounds like a parody of Luke Sissyfag when he speaks. The people you have to reach regarding the wars are the ones fighting in them, mostly young heterosexual men. These guys don't appeal to that sector.